WWHT-FM (Hot 107.9) morning producer Geoff Herbert has trouble taking calls from listeners. Sometimes, he misunderstands what hosts Marty and Shannon are saying to him. 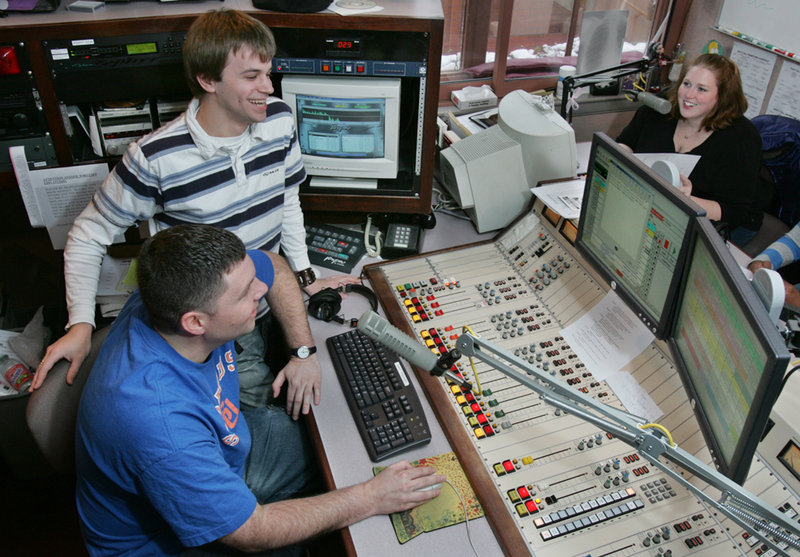 Even if he didn’t call himself “DeafGeoff” on the air, there would be little doubt that Herbert is bringing something quite exceptional to Syracuse morning radio. Herbert, 21, was born with a hearing loss so severe that music often sounds to him like his head is under water. Some notes he can’t hear at all. And yet, despite a speech impediment caused by his severe hearing loss, he is finding early success in a broadcast profession that usually values people with a good ear for hit songs or with a clear voice for announcing. Allowing the hearing-loss humor to flow easily on the morning show is something Herbert says he encourages. That, plus asking people to call him “DeafGeoff, ” are his ways to let others know he embraces his hearing loss and wants others to do the same. He also embraces the local fame that goes with it. A few weeks ago, at the drive-up window of a fast-food restaurant, some employees inside recognized his voice. Technically diagnosed as “hard of hearing, ” Herbert says, he was born with the ability to pick up only about 10 percent of what an average person hears. He uses lip-reading, two hearing aids and an eye for visual cues to understand most of the time what people are saying, although over the phone he often has to ask callers to repeat themselves. Herbert began working at Hot 107.9 two years ago as an intern while he was studying communications at Syracuse University. He performed so well as a volunteer that he was hired in fall 2004 to become Hot’s morning producer. It’s a job that involves getting to the station by 5 a.m. to edit audio clips and coordinate that day’s music, comedy bits, contests, games and other content. On a recent Tuesday morning, shortly after 8:30, Herbert is carrying on a long chat about TV with Marty, who, like Shannon, doesn’t reveal his last name publicly. Marty asks Herbert if he heard about “American Idol” auditions in Boston last summer, hinting that he should have considered trying out for the Fox talent series. Herbert tells Marty he “heard about it plenty.” Then he adds, “Let’s be honest. My singing was not going to get me very far.” They both laugh. Marty and Shannon often make references to his hearing loss, Herbert says, although they draw the line at doing anything smacking of ridicule. “They are very protective, ” Herbert says with a smile. Interviewed off the air, Marty says Herbert is a talented morning producer who does his job well. “I think it’s cool he puts his disability aside and says, “I’m going to do this, ‘ instead of being embarrassed by it, ” Marty says. In addition to his part-time job at Hot, Herbert works nights and weekends at a Blockbuster video store, and is also a disc jockey for private parties and dances. Herbert, who grew up in Acton, Mass., was manager of his high school radio station for 2 years. He was also general manager at WJPZ-FM (Z89), the student station at SU, where he already has met requirements to graduate in May with a bachelor’s degree in radio, television and film. He says his dream is to eventually get a job in radio in Boston or another big city. For what he has done already, Herbert can be seen as an inspiration, especially by young people with a disability who worry some occupations are closed to them, says Anne Costa, director of communications for Aurora of Central New York, an organization that serves people with hearing and visual impairments. Although he’s a rarity, Herbert isn’t the only one with hearing loss working in Syracuse radio. Aurora in November presented an excellence award to WVOA-FM and WSIV-AM general manager Jim Wall, 68, who still does occasional on-air work, despite losing most of his hearing in the mid-1980s due to disease. Costa says Herbert probably has strong support in the deaf community, although she says some might be offended if they thought on-air bits were making fun of him for his hearing loss. Herbert says some aspects of living with his disability are funny. He says he’s not afraid to share this or to show that, like anyone else, he excels at some things and struggles with others. “I want to let people know my hearing disability is part of who I am. I’m comfortable with it and you should be as well, ” he says. Note: This article appeared in The Post-Standard in 2006, years before Herbert started working at the Syracuse newspaper.